Complete transparency into your largest expense items, like material, labor, and more. Get the data you need so you can make fast, informed decisions, manage your resources, and boost your bottom line. You know there are opportunities to improve efficiency, cut costs, and increase your margins. You see it every day when you walk through your facility. And it’s even clearer when you look at your income and cash flow statements. Whether it’s excessive material costs, under-quoted jobs that aren’t profitable, or just incorrect scheduling that has too many workers on shift for too many hours, uninformed decisions can have a significant impact on your bottom line. E2 eliminates the guesswork from your most important decisions. The Data Collection Model harvests information from your employees, work centers, and even your materials and products in real time. You can then access that information in an easy-to-use dashboard, so you can quickly get the data needed to help you make the best decision. The E2 Data Collection module gathers information and delivers it via a wide range of metrics. View how much time each job takes or how much money you’re losing to bottlenecks. Research the productivity of different shifts, work centers, or individual team members. Quickly identify how much money is being lost to material waste. 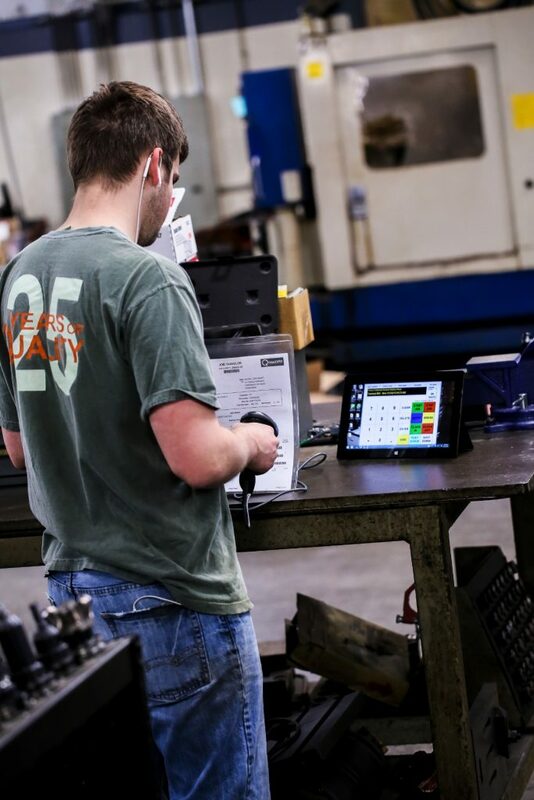 With the E2 Data Collection module, you’re back in control of your shop. You have a wealth of information at your fingertips. No guessing or using your gut. No rethinking your decision. No time wasted trying to research information manually. You can make quick, confident decisions about scheduling, hiring, purchasing, pricing, and more. That allows you to spend less time agonizing over decisions and more time improving your shop. View profitability by job in real time. Access immediate and accurate updates on materials levels. Monitor jobs as they move through your process via information collected through scannable barcode. Use the integrated time-clock function to track employee time and productivity in the building. Eliminate manual timecards that may be inaccurate, difficult to read, or easily manipulated. The E2 Data Collection module is flexible enough to meet your shop’s constraints. Use scanners and other automated technology to update the system in real time, or manually enter data as you see fit. Leverage a batch entry function to input multiple jobs at once after a project is complete. Input engineering and planning time before a job hits the floor, ensuring that all costs are accounted for. Give your employees the ability to input data from the floor through touchscreen mobile devices, barcode scanners, and time-clock systems. Stop making your shop’s most important decisions based on hunches and guesswork. Contact us today to discuss your data collection needs and your shop’s biggest challenges. We welcome the opportunity to learn more about your business and share the powerful benefits of E2. Let’s connect today and start the conversation.